Market leading corporations are deploying control rooms for monitoring and simulation at a rapid rate, especially in growing industries like the energy sector. 1) Big data visualization: corporations have more data than ever before and making sense of it requires a visualization solution as expansive and scalable as the data set. 4) Simulation and data modeling: much less expensive than alternatives, the simulation market in government, military, oil & gas, and corporate product development is growing. Adding 3D or interactivity is a great way to increase the effectiveness of the modeling exercises. 5) Keep pace with market expansion: Key sectors ranging from energy to security are experience rapid growth worldwide and control rooms are being deployed and reimagined to reflect the customer needs for reliability, convergence, and interactivity. 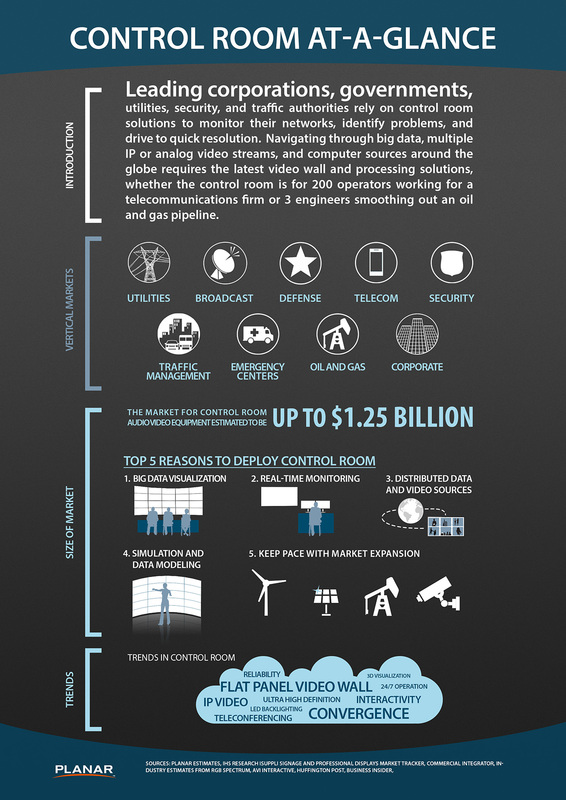 For more information, download the complete infographic at Control Room-at-a-Glance infographic. Planar is a pioneer in the control room, leading the industry to HD resolutions, 16:9 aspect ratios, to LED illuminated rear-projection displays, image processing, and flat panel LCD video walls. See http://www.planar.com/solutions/control-room/ for more details.